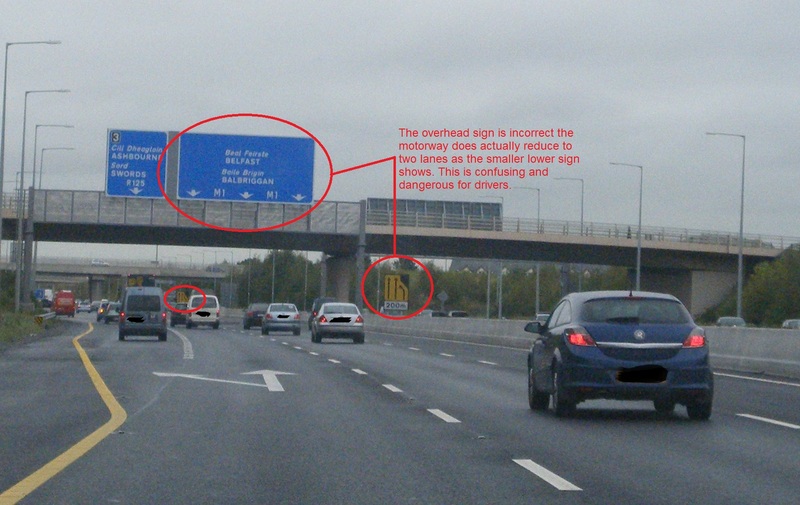 Further to my article about dangerous merging traffic markings on roads in Ireland, see here. I have recently experienced another example of poor road signage. The location is only a few kilometers from the example above. It in on the M1 motorway going north bound where the three lane motorway reduces down to a two lanes close to Swords, County Dublin. The overhead gantry signage is the problem this time. Basically 200m before the road changes from three lanes to two lanes the overhead sign instructs drivers to use all three lanes. But small signs on the road edge are telling drivers to merge from the outside lane to the inside lane. I found myself trying to merge at the last minute as I was following the overhead signs and only realised at the last minute that my lane was disappearing. It is time signs like this are updated/ removed to avoid driver’s having to carry out quick and possibly dangerous manoeuvres.